#058 The Mystery Of Iniquity Part II: Who Is The Antichrist? | That's In The Bible? 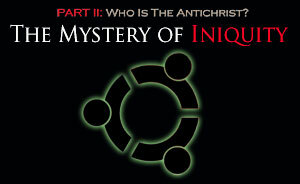 #058 The Mystery Of Iniquity Part II: Who Is The Antichrist? 1 1Ti 3:16 And without controversy great is the mystery of godliness: God was manifest in the flesh, justified in the Spirit, seen of angels, preached unto the Gentiles, believed on in the world, received up into glory. 1Co 4:1-2 Let a man so account of us, as of the ministers of Christ, and stewards of the mysteries of God. 2 Moreover it is required in stewards, that a man be found faithful. Do you think God put those mysteries there to stay a mystery? Then tell the minister to be a steward of the mysteries? But there are clues to give us some understanding. 2Th 2:1-4 Now we beseech you, brethren, by the coming of our Lord Jesus Christ, and by our gathering together unto him, 2 That ye be not soon shaken in mind, or be troubled, neither by spirit, nor by word, nor by letter as from us, as that the day of Christ is at hand. 3 Let no man deceive you by any means: for that day shall not come, except there come a falling away first, and that man of sin be revealed, the son of perdition; 4 Who opposeth and exalteth himself above all that is called God, or that is worshipped; so that he as God sitteth in the temple of God, shewing himself that he is God. 2Th 2:8-10 And then shall that Wicked be revealed, whom the Lord shall consume with the spirit of his mouth, and shall destroy with the brightness of his coming: 9 Even him, whose coming is after the working of Satan with all power and signs and lying wonders, 10 And with all deceivableness of unrighteousness in them that perish; because they received not the love of the truth, that they might be saved. Joh 6:69-71 And we believe and are sure that thou art that Christ, the Son of the living God. 70 Jesus answered them, Have not I chosen you twelve, and one of you is a devil? 71 He spake of Judas Iscariot the son of Simon: for he it was that should betray him, being one of the twelve. Jer 48:24-25 And upon Kerioth, and upon Bozrah, and upon all the cities of the land of Moab, far or near. 25 The horn of Moab is cut off, and his arm is broken, saith the LORD. Zec 11:15-17 And the LORD said unto me, Take unto thee yet the instruments of a foolish shepherd. 16 For, lo, I will raise up a shepherd in the land, which shall not visit those that be cut off, neither shall seek the young one, nor heal that that is broken, nor feed that that standeth still: but he shall eat the flesh of the fat, and tear their claws in pieces. 17 Woe to the idol shepherd that leaveth the flock! the sword shall be upon his arm, and upon his right eye: his arm shall be clean dried up, and his right eye shall be utterly darkened. Context Zec 11:12-13 And I said unto them, If ye think good, give me my price; and if not, forbear. So they weighed for my price thirty pieces of silver. 13 And the LORD said unto me, Cast it unto the potter: a goodly price that I was prised at of them. And I took the thirty pieces of silver, and cast them to the potter in the house of the LORD. Ac 1:16-20 Men and brethren, this scripture must needs have been fulfilled, which the Holy Ghost by the mouth of David spake before concerning Judas, which was guide to them that took Jesus. 17 For he was numbered with us, and had obtained part of this ministry. 18 Now this man purchased a field with the reward of iniquity; and falling headlong, he burst asunder in the midst, and all his bowels gushed out. 19 And it was known unto all the dwellers at Jerusalem; insomuch as that field is called in their proper tongue, Aceldama, that is to say, The field of blood. 20 For it is written in the book of Psalms, Let his habitation be desolate, and let no man dwell therein: and his bishoprick let another take. Ps 109:6-9 Set thou a wicked man over him: and let Satan stand at his right hand. 7 When he shall be judged, let him be condemned: and let his prayer become sin. 8 Let his days be few; and let another take his office. 9 Let his children be fatherless, and his wife a widow. Joh 13:26-27 Jesus answered, He it is, to whom I shall give a sop, when I have dipped it. And when he had dipped the sop, he gave it to Judas Iscariot, the son of Simon. 27 And after the sop Satan entered into him. Then said Jesus unto him, That thou doest, do quickly. Lu 22:3 Then entered Satan into Judas surnamed Iscariot, being of the number of the twelve. 2Th 2:1-2 Now we beseech you, brethren, by the coming of our Lord Jesus Christ, and by our gathering together unto him, 2 That ye be not soon shaken in mind, or be troubled, neither by spirit, nor by word, nor by letter as from us, as that the day of Christ is at hand. This entry was posted on January 21, 2012 at 3:04 pm and is filed under That's In The Bible - Podcast. You can follow any responses to this entry through the RSS 2.0 feed. You can leave a response, or trackback from your own site.